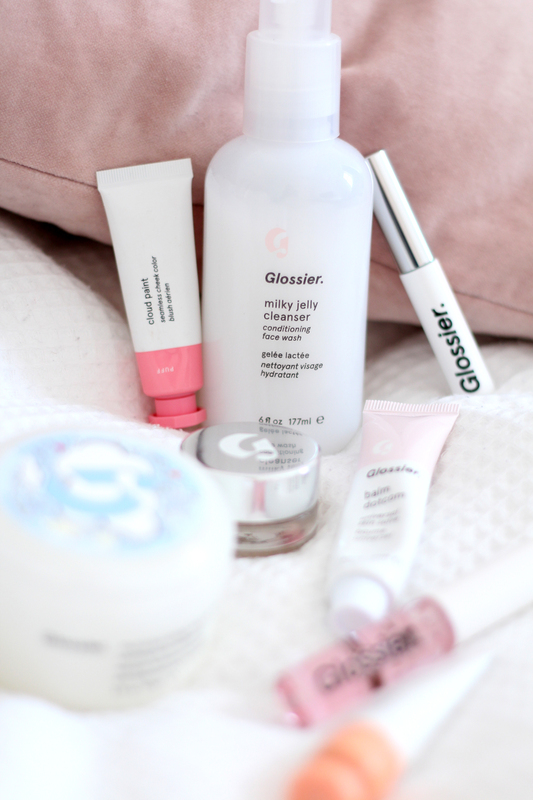 Yes, ladies and gents, the moment beauty bloggers and makeup lovers have been waiting for: Glossier now ships to the UK. Woo, yeah etc. Sidenote -before I begin, you can get 10% off with this link, just so ya know. Anyway, I placed an order a little while ago - which you can see more on here - and I've been testing the products ever since. So, I think I've given them enough time for me to make my mind up on what's worth a purchase and what's just ok. Let's start with the best, shall we? First of all, I've been head over heels obsessed with the Glossier Cloud Paints. They're basically a liquid blush in a little tube and you need a very small amount to notice the colour. And I mean small, I once put on too much and looked like I'd been left in a sauna for an hour once... I guess we can conclude that makes them very pigmented and cost-effective, as you'll get a lot of use out of such a small tube. I got the shades Puff which is the perfect flushed pink shade and Beam, a gorgeous peachy tone which really warms up the face. I'll totally be ordering the other shades asap! Another product I love is the Glossier Moisturising Moon Mask. Not only do I adore the packaging, but the product inside does exactly what it says on the tin (tub?). It says 20 minutes, but I only leave it on for ten and it still works effectively to give your skin a big boost of hydration, leaving it plump and soft - perfect! Another product I've enjoyed testing is the Glossier Stretch Concealer which is a hydrating, light-medium coverage concealer which would suit most skin types. This does have more of a sheen to it, so I tend to use it around my face or under the eyes if they're looking especially tired! Now, I don't want to hate on any Glossier products as there's honestly nothing wrong with any of them. I just have the products that stand out and the products that are fine - I'll continue to use them - but they didn't blow my mind. Controversially, the Glossier Balm Dotcom makes it onto this list. Now, bear with me, because I do really like it, but I just wish I had of got a flavoured version instead of the plain one. It isn't exciting at all, as it's just a fairly standard long-lasting lip balm, but if I had of got the cherry or the birthday cake version then I think this would be on the love list. The Glossier Milky Jelly Cleanser is also here because it's nice, but not on the repurchase list. If you're in the market for a standard morning or second cleanse cleanser, then this one may be for you, but to me there was nothing magical about it. It gets the job done and leaves your skin feeling soft, but it doesn't feel like a treat which I prefer my skincare to be! Next we have Glossier Brow Boy. Now, I wanted this for low-maintenance brow days where I could brush a bit through and walk out of the door, but I just couldn't get this to work? I'd have to brush loads through to get any noticeable effect, but then I was left with a lot of product used but without the definition that I'd get when I use a brush. However, if you barely do anything to your brows makeup-wise, then you may love it! Finally, the Glossier Lip Gloss. Just don't bother unless you like the 90s hair-sticking-to-your-lips effect.